What an appropriate card with which to begin the month of February! I admit, I do believe we will all be a bit too busy to be focusing on love, but let us make the most of each day. 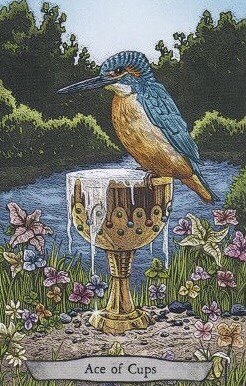 This card is representative of success and emotional fulfillment, in the cup runneth over type of way. In regard to the perception of said cup, the saying “It is not about whether the cup is half-full or half-empty, the cup can always be refilled.”, comes to mind. Whichever way you may find yourself thinking today, do remember these words by which to live. Venus, exalted in Pisces, is at the tail-end of its tour through this sign. As with everything that hits the anaretic degree of Pisces, this may feel like some extreme energy to you (remember last week right before the New Moon when Mars was at 29 degrees Pisces?). So, if you are feeling a bit emotional in either direction, know that on the third, Venus will move on in to Aries. Take this emotionally-charged energy which is available to you today and turn it into unconditional love for humanity. Humanity could certainly use it. This entry was posted in Card of the Day, General Tarot, Readings, YouTube Videos and tagged Ace of Cups, Card of the Day, Guidance, Path, Reading, Tarot. “I chose to represent balance with a tightrope walker, in a rich outfit in sumptuous surroundings. The figure is your, representing the confidence and joy in life of a generous spirit. The balls can be seen as coins – material wealth, or as tools for the clown’s art, representing less tangible riches. The clown itself is androgynous, a balance between male and female, and the little cars are both pathetic and cute – needy, but not totally destitute. A clown stands, juggling balls as she performs acrobatics on a rope. She has perfected her act, and now involves the awaiting cats – her act representing a person who is materially comfortable, and willing to share. As she takes one ball from above, she passes another below her, but in this case the balance has been thrown off. These cats are part of the show, but remain passive, unwilling to play with the balls passed to them – one lying near them, already discarded, with no need of the next proffered by the clown. This card represents a need for balance – a willingness to share when times are good, but cautions against giving for giving’s sake. Give and take are a part of life, but we should only take what is needed, we should only give what is wanted, and nothing more. This entry was posted in Deck Review, Featured Card of the Day, General Tarot, Readings and tagged 6 of Pentacles, 78 Tarot, Artist, Carnival, Guidance, Path, Reading, Tarot. Talk about perfect timing! This is a karmic card, representing, of course, Justice, but it is about so much more. Very often two sides can be in disagreement, and while neither may be totally right, there may need to be a third party, acting in an unbiased fashion, in order to render a fair and impartial decision in a particular matter. This will ring true to those of you out there who are involved in any legal entanglement, especially if you have felt your voice is not being heard, and that things are proceeding in an unfair fashion. Very often this can be a legal matter in your life, but not always one which involves the court system. You could find yourself pondering the pros and cons of moving, perhaps putting your current home up for sale. Something in your life may require you to balance out the facts to come to a conclusion which will benefit you in the long haul. The sword of Justice demands that things be fair, and this may be your current outcry. This merely feels like the beginning, so I would not think Justice today is only for today. We are entering eclipse season, and as the cards have been indicating, something in your life begs for fairness and the truth. February will show you how to achieve it. This entry was posted in Card of the Day, Readings, YouTube Videos and tagged Card of the Day, Guidance, Justice, Path, Reading, Tarot. A young carney stands, holding a shining gold pentacle and staring at it, amazed. He is a sideshow barker, a little cog in the great wheel of the circus, but he has just been given his first gold coin – a tempting treasure for a child, a glimpse into a potential future of comfort and personal prosperity. Behind him are posters advertising the counties of his carnival – an ape man within a lush, green setting, and a freak show human scarecrow guarding the future harvest from the black birds that would ruin it. This card represents a dream, a new goal, and the understanding that it will take time, perseverance and effort. Be pragmatic – you will need to work hard to gradally collect wealth, rather than it all come to you. This entry was posted in Deck Review, Featured Card of the Day, General Tarot and tagged 78 Tarot, Artist, Carnival, Guidance, Page of Pentacles, Path, Reading, Tarot. Today’s card from the Book of Shadows Tarot, is another card of safety. Have you noticed the emerging theme since the 26th? The fairy is showing the woman the safest route. One of the things which you need to remind yourself time to time, is that your way may not always be the right way. Occasionally, the Universe steps in and steers you in a more appropriate direction, and you merely need to keep the faith and follow the signs. The 6 of Swords is a card of transition, often indicative of depression. However, with the Mars energy having shifted from Pisces into Aries, you can find yourself more ready, willing and able to move forward. 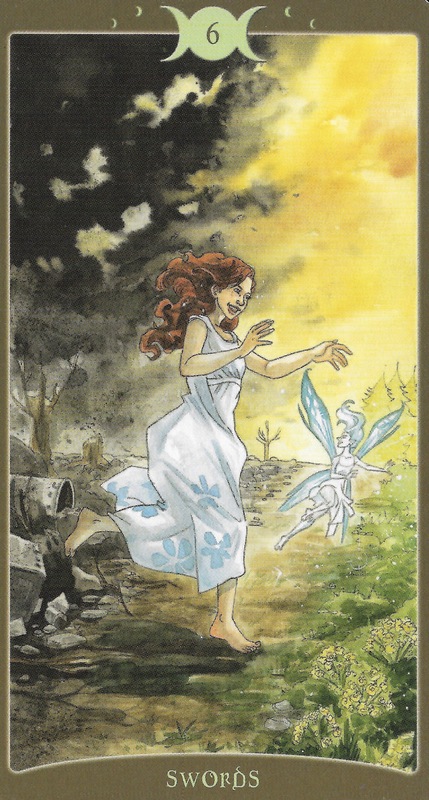 Notice that the yound lady is feeling rather carefree and gleeful as she follows the fairy. The type of transition that this card represents is one from troubling times toward ones which will begin to go much smoother. You just need to keep the faith. “The knife thrower’s assistant sits in the face of danger as the knives and projectiles around her pin three cups, mystery, power and the supernatural to the bulls-eye. Meanwhile, two cups serve as her earrings, companionship and fortune. The laurel cups sits on her head as a symbol of victory and the cup she drinks from represents wisdom. A performer stands before an old wooden board – like it, she is a veteran of the act, nonchalant enough that she idly daydreams while knives fly. 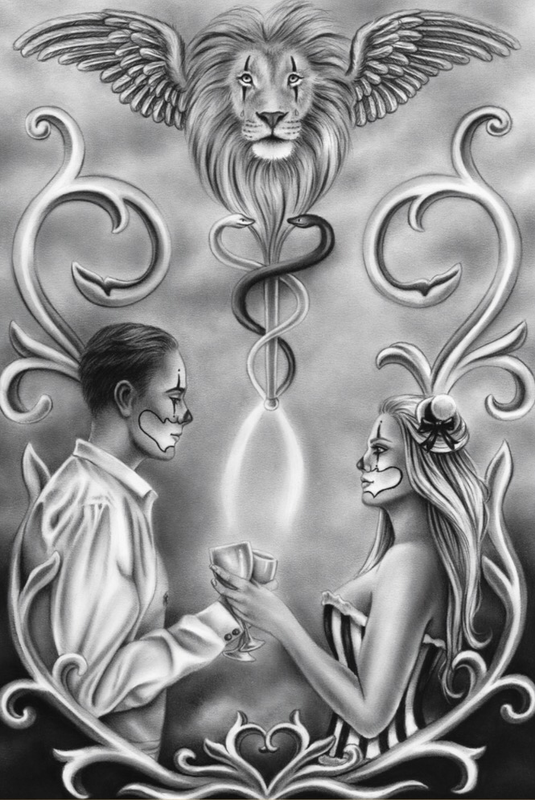 But her imagination has led her astray – a cup she drinks from is just an illusion, the snake winding around it symbolizing her wisdom and experience. Six other cups, all figments of her imagination, show different desires, treasure on one by her ear representing wealth, a shrouded figure on another standing for enlightenment. Each “prize” shown has a darker side – the snake is a dangerous creature, the shrouded figure a ghost, illustrating that dreams help us explore our shadows. But this card warns that there is an inherent danger in dreams themselves, inspirational as they may be, given their rightful time and place. You can get so caught up in your fantasies that you remain immobile, unable to achieve your goals. 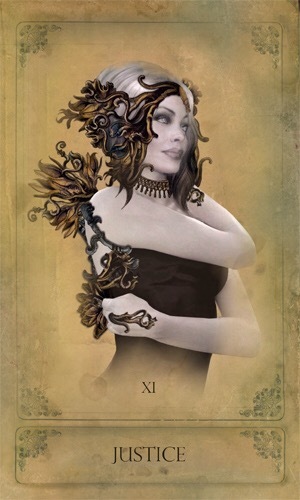 This entry was posted in Deck Review, Featured Card of the Day, General Tarot, Readings and tagged 7 of Cups, 78 Tarot, Artist, Carnival, Guidance, Path, Reading, Tarot. Many put down cards for themselves every day, hoping to see this card come up, because their only focus is love. I have been asked why I do not push this as a steady meaning; the answer is quite simple…as a Tarot reader, I feel the need to call things as I see them. As for today, this image from the recently-released deck, 78 Tarot Carnival ~ Cirque du Tarot, could not be more appropriate. There is a meeting of minds taking place here, which involves people coming together on the same page, or not. This ties in with the events of recent days, and you may perhaps find yourself in what you would otherwise consider to be an unholy alliance. Notice the face paint prevents you from totally seeing the faces of the people on the card. Perhaps this is part of your self-preservation, one face for this one, one face for that one. However, with Mercury out of shadow and Mars in Aries, so much is being said, yet Mercury is still in Capricorn until it enters Aquarius on February 7. At that time, the conversations will become more real and truthful. The theme of February (you may wish to check out the Love and Finance video below) is truth, so one can not hide behind the face paint and be nice for too long. This entry was posted in Card of the Day, General Tarot, Readings and tagged 2 of Cups, Card of the Day, Guidance, Path, Reading, Tarot.